Here is a snapshot of how law firms approach the topic of "Experience Management:"
It's someone else's job - "Put a few people together from IT and marketing and see what you can come up with. Make a recommendation. Don't bother the lawyers." Toe in the water - "See if you can find a willing practice group to be our guinea pig." Sharing isn't mandatory - "I don't want to share my matter list in case I leave the firm. (Or, because it's in such disarray, I'd be embarrassed if you saw it.)" Paralysis - "We have everyone on board. We have no idea where to begin." Inclusion - "We want to include every matter from the dawn of time." Culture-fixer - "We want the experience database to bring lawyers together so they'll trust each other - so they'll finally cross-sell." We get asked a lot "Where do we begin?" For experience management NOT to be a flash-in-the-pan "initiative," it has to get the attention of the executive suite. Not a casual glance, but serious attention. It has to be fully aligned with the firm strategy - whatever it is. Below are a few strategic goals and how experience management is aligned with each one. Revenue growth - This is the most obvious and popular strategy. Without relevant experience to evaluate, buyers of legal services will not hire you. It's that simple. Institutionalize more clients (i.e., grow company relationships) - All firms want to represent organizations in more key areas. To see where you can go, you have to understand where you've been. In terms of knowing all the work you've done in for this client - and getting a full picture of the relevant experience you've done in the targeted new practice areas. Other clients have benefited from your experience - how can you apply that to the clients you want to further institutionalize? Build your reputation - There are literally over 1,000 directories and ranking organizations that evaluate law firms and lawyers. Aggregating experience across the firm in advance of the annual Chambers surveys is too often a fire drill, just to name the most ubiquitous one. (Why? We know it happens every year.) Your experience must be elevating and comprehensive - it must be career defining for you to get the reputation boost you are seeking. Strategically plan what you need to collect and create a habit of doing it all year long. Remember that perfect is the enemy of good when it comes to experience management. Too many firms are trying to build the perfect tool that does everything - and it never gets launched. Or, it's so unwieldy and complex that lawyers won't use it - and you've now blown your opportunity to build a strategic system that will support their revenue, relationship and reputation goals. The "Marketoon" below was created by Marketoonist Tom Fishburne. We have been in meetings that looked just like this. Too often, it hinders and hurts the end result - resist the temptation to feature-stuff. "Lean Data" makes more sense for law firms than big data. Big Data is getting bigger. According to research firm IDC, big data services and technologies will grow at a compounded rate of 27%, exceeding $32 billion by 2017. The greatest challenge is knowing how to make it work for us in a law firm - how can we learn from it, affect change with it, make progress and grow revenue? Data pours in from new sources and channels every day. Sifting through all the signals and noise is an enormous daily undertaking, and extracting insights (the proverbial needle in a haystack) that drive smart business decisions is more difficult by the hour. 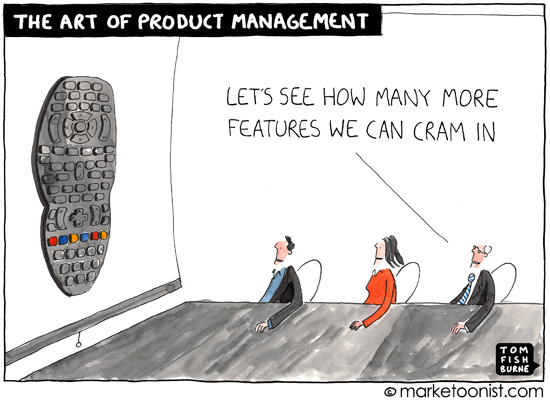 Tom Fishburne's Marketoon shows how big data can "prove" almost any conclusion. Therein lies one of the greatest dangers: when the data set is so huge and your goals aren't clear, the data can tell you almost anything you want it to. “The dirty secret of big data is that no algorithm can tell you what’s significant, or what it means. Data then becomes another problem for you to solve. A lean data approach suggests starting with questions relevant to your business and finding ways to answer them through data, rather than sifting through countless data sets." Proposal win/loss analyses - why did you win? Lose? To whom and why? Process improvement analysis – where can you streamline what you are doing, save time and get better results? On the MediaPost Agency Daily (MAD) blog, Jason Harrison shares advice for marketers who want to be more effective in their data management in Making Sense of all that Data. Jason is the Founding CEO of Gain Theory. Ask Answerable Questions - Don’t aim for something unattainable – start small and build small victories into something large. Don’t let the objective be “deal with Big Data” or something vague and unending. With this approach, you’ll build capability, credibility and momentum, all while delivering better results. Then you will be better prepared to answer the big, ugly, complex questions your organization has been asking, like: What is the long-term impact of our marketing on share price? Free Your Data - Figure out where your key data lives and liberate it. Take the opportunity to collaborate across the organization to unite seemingly disparate organizations and their data to see what connections can be made and what new questions can be asked and/or answered. Build relationships with the stakeholders who control those data sets by creating a common set of goals right off the bat. In the end, you’ll need their partnership to build something meaningful and lasting. Select Smart Partners - Work with a partner who will enable you to make progress quickly. Your partner should be your guide through the mountain, helping you navigate the data in jargon-free terms, simplifying the process while providing actionable options to deliver results quickly. In delivering small, tangible results, you will be able to effectively manage internal stakeholder expectations. Create SMART Data Goals - Just as you would set SMART (Specific, Measurable, Achievable, Realistic and Timely) goals for your staff, set similar goals for your data. This approach helps you avoid becoming swamped by your data and instead tackle it in small chunks. This means setting extremely pointed, quantifiable goals for your team that are clear, concise and understood by all. Then continue to check in on how you’re doing against them along the way to ensure you’re on track and not veering from your intended outcomes. The first "marketing and math" presentation I gave was for the now-defunct Marketing Directors' Institute conference 15 or so years ago. It was, looking back on it, rudimentary - but it was a start. I told the law firm marketing audience to care about client and matter profitability, realization and billing rates, staffing ratios on particular types of matters, alternative fee arrangement scenarios (yes, even then), RPL, PPP, PPEP, and more. Fishburne describes the conundrum as tension that exists between marketing and math. I think it's more black and white than that. Some days marketers love data and other days they hate it. Occasionally data works in our favor (i.e., supports our point of view - see "acceptance" in the illustration above), and sometimes it works completely against us - (see "anger" above). "Big Data" is getting bigger. According to research firm IDC, big data services and technologies will grow at a compounded rate of 27%, exceeding $32 billion by 2017. The greatest challenge is knowing what to do with it: How can we learn from it, affect change with it, make progress and grow revenue? Client loyalty interviews - who else are these clients hiring and for what? This is just a start and the tools are readily available to most firms. The key is to start - Roll up your sleeves and say, "I'm going to love me some Brussel sprouts today." Jordan Furlong, legal industry consultant and popular blogger, and I have recently been emailing about "courage" and what it means to lawyers and their clients. He just published a penetrating post called "What Leadership Really Means," that gets to the heart of courage and why it's so important for lawyers to understand it. Fundamentally, because it's what clients want from you. ...Either recommend something or recommend against it, strongly if you so choose; but you must take a stand with your advice and you must sign your name to it. Invariably, every new lawyer in the company, when first confronted with this memo, comes to John asking for the middle-way option, and he always refuses. The client, he tells them, is paying us to advise them. So: advise — and be ready to live with the results. Advice is a different beast. Clients act on advice, making decisions that carry consequences ient. You’re not just writing a memo anymore; this time, it counts. It’s the difference between “What does the law say?” and “What should I do now?” There’s a good argument that advanced technology (e.g., expert applications, IBM’s Watson) could provide sound legal analysis; but nobody seriously argues that technology can render trusted counsel, or that any client would act on such counsel even were it offered. To my mind, a lawyer “grows up” the first time she gives actionable advice to a paying client. You’re not just writing a memo anymore; this time, it counts. Most law firm partners with whom I work are extremely good at both analysis and advice. The older they are, the more that judgment and past experience inform their counsel - and the quicker the advice comes, even when confronted with an issue, challenge or opportunity they haven't seen before. When interviewing partners, few are wafflers when they describe the role they play with clients - they are clear-headed, sharp-witted and pragmatic in the advice they give. No flip-floppers. And most of them love what they do. Why then, when it comes to business development and marketing decisions that impact their firms are the lawyers immediately less comfortable, less courageous? They fall victim to what Jordan describes above as occupying "a safe, low-stakes position." The daring lawyer who is a zealous and outspoken advocate for his client's position becomes afraid to stand out or be memorable when it comes to positioning strategy, branding design, messaging, even a business development approach that could help him win a new client. "Discussions of courage often begin with the literal meaning of the word. It's an old French word derived from the Latin 'cor' for heart. Knights would pledge their hearts, i.e., their lives, to their lords in a solemn act of 'courage.' The knight was literally giving his heart, and the meaning of giving one's heart is fidelity. Nowadays, we call this a fiduciary pledge. "These archetypes lie not too far below the surface of the modern business agreements that bring lawyers and clients together. And not just lawyers, but professional advisors of all kinds. When I retain you for your advice - that is, ask you to go to battle for me, I am not asking that you hedge your answers, I am asking that you act on your fiduciary pledge and give me what lies in your heart. And what lies in your heart is all that you really have to pledge to the marketplace. "Does this mean pretending to be a battlefield general in corny TV commercials? Of course not. What it means is to know your own heart, and speak it loudly and clearly - in court, client meetings, and in marketing and business development. This is what makes potential clients say to themselves, 'that's my lawyer.'" "I once undertook a major remodeling of my home, an effort that would involve the relocation of walls and an overall revamping of the floor plan. I had no idea how best to accomplish this, and really wanted someone WHO KNEW WHAT THEY WERE TALKING ABOUT to tell me what to do. "I retained an architect and explained to him that I wanted to create a more open living space, but had no idea what the best configuration would be and I needed him to show me what would be best. His response was to draw up plans on graph paper and mail them to me with 'what do you think?' scrawled across the bottom of the page. "I did not know what to think; I was not, am not an architect. I had no idea what the final results would look like, which is why I hired an architect. We went around and around on this for a while, before I finally fired him and the contractor stepped forward and said, 'here is what I think would look best,' to which I said 'thank you' and the house is, to this day, as he recommended." Some law firms employ a toe-in-the-water approach, believing that partial acceptance of a strategy works (i.e., provides a return on the investment). These lawyers think that if the initial little test didn't hurt too much, then they can try a little bit more the next time. It's like tasting Kale for the first time - no one starts with a heaping plateful. With positioning, business development and marketing strategy, however, watering it down or taking baby steps just puts you smack-dab in the middle of the noise - with the tens of thousands of other messages that we receive on any given day. Here are the cold, hard facts: We receive 30,000 messages each day (in 2002, it was 10,000). The only way for us to deal with this blizzard of activity is to tune out those messages that don't make it into our short and long-term memory. We tune out consciously, sub-consciously and unconsciously. We all do it. Your clients are tuning you out right now and they aren't even aware they are doing it! A sad by-product of the recession is that law firm leaders lost courage - they lost their willingness to show their heart. In 2005-2007, positioning strategy for large U.S. law firms was evident and often distinguishing. Clients knew what these firms stood for. Not so today. Budgets were slashed in 2008, but they have gradually been restored. Today's "strategy" is almost universally business development centered - win more work. I should say, profitable work. That's good - but not to the exclusion of an over-arching strategy that differentiates you among your many fine competitors. Effective, resonating strategy, messaging and design can elevate you, make you memorable and enable you to own your prospect's mental real estate (your client or prospect's brain is the ultimate land-grab). But lawyers have to be willing to share and show their heart to be memorable. To put that stake in the ground. To want to be remembered. (NOTE: If they don't remember you, they can't hire you.) And even if they like you and the work you do, they still hire other firms. So, lawyers, take a hard look in your marketing mirror and be critical. What is your strategy? What is your position, your brand? For what are you known and remembered by the people who matter most to your career? Where is your courage? It takes courage to design a memorable strategy and brilliantly execute it. The other things it takes are commitment, consistency, cleverness and cost. When it comes to winning at marketing and business development, 10% or 20% courage doesn't cut it. Be as committed, pragmatic and driven in your marketing choices as you are in representing your clients. I promise, it will be rewarded. I have written many posts on this blog about effective experience management as a mission-critical, business imperative for a law firm. Without relevant experience to evaluate, buyers of legal services will not hire you. It's that simple. That's how urgent it is. That's why you should have a mandate around experience collection and organization that starts with your firm chair and executive committee. These initiatives are difficult. We work with clients to make them less complicated, often resetting expectations, streamlining workflow and ensuring that the focus is on the most important things (saving time and making more money). Nonetheless, they are challenging. This fact should not be allowed to impede progress, however, or prevent a firm from investing in an experience management program. Turnover in the project team. Project leaders and team members make decisions about project structure based on what they believe they need to make the project successful. When those people leave the project or firm, others with different ideas enter the equation. They want to reconfigure things so it meets their needs and expectations. Such changes aren't always bad, but they will cause delays and generally raise project cost. It's important for the first team to document their decisions and rationale for future team members who might inherit the reins. Understanding the reasons for the original choices is a positive step forward, enabling the new team to leverage investments made by the first crew on the project. A commitment that wanes. It's no different than a diet, it's hard to keep the same level of commitment on day 30, 60 or 365 that you had on day one. Whatever keeps you motivated and going to the gym (feeling better, fitting into skinny jeans, a doctor that fist-pumps you), do the same with your experience database project - the fact that you will save time and make more money should be a strong motivator. Your job will also be infinitely easier, because business development preparation, RFPs and proposal responses, reporting and tracking, will all be EASY compared to how you manage it today. Below is a guest blog post by Peter Vogel. He offers excellent advice for marketing technology and IT managers pondering these and other business development/marketing tech implementations. It is based on Infoworld's 2013 report entitled, "11 signs your IT project is doomed." Successful IT projects are rarely noticed, only the disasters which can generally be avoided by having detailed contracts that spell out exactly what will happen, and who will do what. Involving a lawyer with IT experience at the earliest point of IT planning (before the RFP is issued) can make sure that all things that can go wrong are spelled out in the contract, so when those things actually go wrong, the parties have already decided what will happen. When lawsuits and trials occur because of failed IT projects, no one is ever happy with the outcome. Of course the cost of a failed IT project is always more than a successful IT project.